C.J. Anderson tries to break free from Nicholas Morrow on October 1, 2017 in Denver, Colorado. Photo by Matthew Stockman/Getty Images. Despite knowing he was on the trading block last month, Anderson will report for the Broncos' 8 a.m. team meeting. KUSA – Players report for the start of the offseason workout program Monday and C.J. Anderson is still a Denver Broncos running back. Despite knowing he was on the trading block last month, Anderson will report for the Broncos’ 8 a.m. team meeting and extensive physical exams on Monday. It’s not the usual circumstance for a running back coming off a1,000-yard season who also rushed for 90 yards and a touchdown two years ago in Super Bowl 50. Then again, it could have been worse. It can always be worse. Anderson hasn’t been released a month after the start of free agency, as star receiver Dez Bryant was Friday by the Dallas Cowboys. Bryant was let go in lieu of his $12.5 million salary. 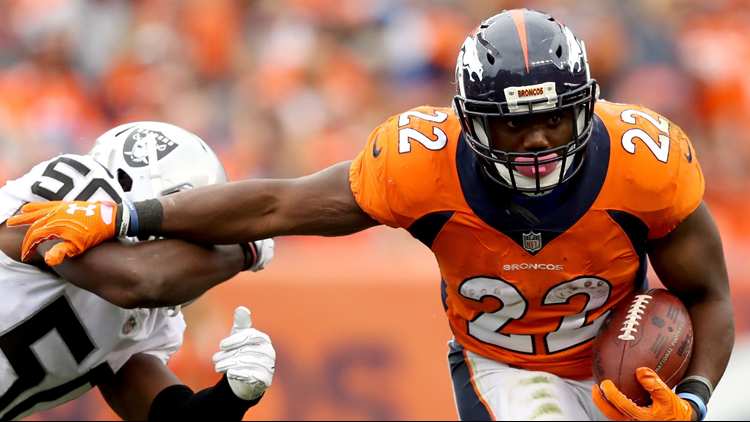 Anderson was on the trading block in part because of his $4.5 million salary but also because the Broncos want to create more playing time for Devontae Booker, De’Angelo Henderson and the running back they seem certain to select in the upcoming draft. Miami and San Francisco showed the most interest in acquiring Anderson but no trade was executed. Anderson understands he’s not yet guaranteed to stay on the Broncos’ roster for the 2018 season. The Broncos have the No. 5 overall draft pick and Saquon Barkley is a possibility, if not a probability as the prevailing assumption is the Penn State running back will be taken within the first four selections. The Broncos, though, have brought in several other running backs on pre-draft visits in recent days and this class is considered deep at that position. But can’t that be said of every NFL player? That at any moment, they can be traded or released? Clearly, Anderson has a chip on his shoulder. He’s had one since he went undrafted out of Cal in 2013. It’s served him well. In the final eight games of the 2014 season, he combined for 1,057 yards and 10 touchdowns rushing and receiving to earn a Pro Bowl appearance. He had 1,176 yards rushing and receiving and seven rushing touchdowns in 2015 (counting the postseason). He was on pace for nearly a 1,300-yard rushing/receiving season in 2016 when he was halted by a game 7 knee injury. He rushed for 1,007 yards on 4.1 yards per carry last season and added another 224 yards receiving on 28 catches. Only now that chip has grown to the size of a boulder. Anderson just turned 27 so he figures to have plenty of good football left in his powerful, tackle-breaking legs. But after Anderson made $9 million the past two seasons, the Broncos may or may not want to pay him another $4.5 million in 2018. It figures that the longer he’s a Bronco, the more likely he will stay a Bronco. But more will be known the night of Friday, April 27, when the Broncos complete the first three rounds of their draft. By then, Anderson will have participated through the first two weeks of the Broncos’ offseason conditioning program.